The head instructor at Mountain Wind Aikikai, Max Roach Sensei, has trained in Japanese martial arts for more than twenty years. He is affiliated with Japan's top authorities in both Iaido and Aikido. Students of the Mountain Wind Aikikai have the opportunity to study both Muso Jikiden Eishin-Ryu Iaido as well as Aikido – The Way of Harmony. The Mountain Wind Aikikai is active within the local Japanese Community. 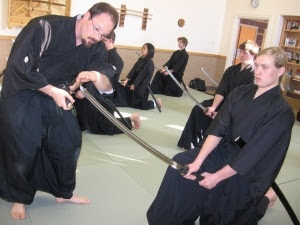 Roach Sensei feels strongly that his obligation, as an instructor of Iaido, is to preserve the cultural, historical, and sociological traditions that are in danger of being lost. Roach Sensei and his students are honored to promote and preserve these unique and distinctively Japanese arts. 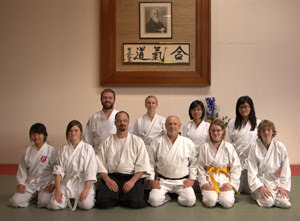 We welcome anyone who is committed to learning and preserving the traditional arts of Iaido and Aikido. Aikido is a Japanese martial art that focuses on ethical conflict resolution. Founded by Ueshiba, Morihei, aikido employs sweeping circular movements, joint manipulation, pressure points, sweeps and throws; all in an effort to blend with the attacker's energy and leading it towards deescalation. Aikido develops a calm and joyous spirit and promotes a host of health and wellness benefits. Iaido is the art of traditional Japanese sword drawing. Originally the art of the quick-draw, iaido evolved into a form of moving meditation during Japan's renaissance. Known for its beauty, grace, and deadly efficiency, iaido develops a sense of focus and tranquility within its practitioners.